At the end of last year, Waymo One launched as the world’s first public self-driving car service. The Android app for Waymo One is now officially available on the Play Store, with the Alphabet division opening a waitlist for Phoenix, Arizona. The app today reveals several details about how the autonomous service will function. Waymo One launched in December for the hundreds of existing Early Riders that tested the autonomous vehicles over the past year. With the Android client arriving on Google Play as an “unreleased” app, residents of the Metro Phoenix area can join the waitlist. Once invited, the sign-up process involves confirming your phone number by sending a standard code that has to be entered in the app. Users need to add a payment method, with multiple cards and the ability to switch depending on the ride supported. The app’s UI is similar to Lyft or Uber’s client. The bottom bar features three tabs for My ride, Support, and Account. 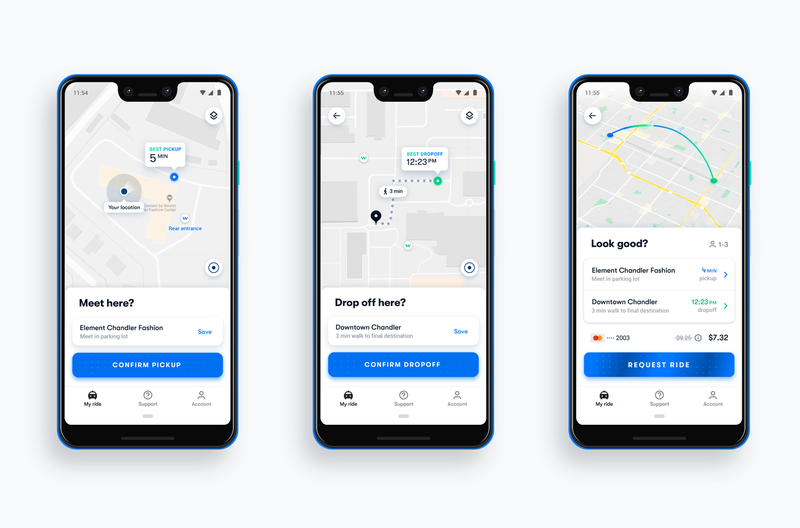 Before requesting a ride, users are asked to confirm the pickup and end destination, with the amount due and payment method listed. At the same time, the autonomous vehicle can cancel if passengers don’t arrive to the designated pickup spot in time. Once a vehicle has arrived, users can remotely honk its horn to find it. To date, Waymo’s fleet only features the Chrysler Pacifica, with the Jaguar I-Pace in testing. To physically enter the vehicle, Waymo uses Bluetooth to unlock the sliding minivan doors. The app prompts you to make sure it’s enabled on your device, with an “Unlock” button once ready. Once in the vehicle, there are two touchscreens behind the front seats to tap “Start ride.” During a trip, the Waymo app provides a live map view and time estimate, with physical screens in the Chrysler Pacifica also noting trip progress. Once signed in with your Google Account, the Waymo app reveals several integrations. First is the ability “stream your favorite playlists” from Play Music after granting permission to Waymo. It’s not clear whether music is being streamed/controlled from your phone, or whether music will appear on the two touchscreens. <string name=”google_play_music_consent_message”>Stream your favorite playlists while riding with Waymo. To listen while you ride, allow Waymo to use your Google account %1$s for Google Play Music. A possible Google Calendar integration could automatically pull locations from events so that users do not need to manually enter an address. <string name=”pref_summary_personalized_places_data”>Allows Waymo to access your Google Maps and Places data. By enabling this you will receive personalized autocomplete and search results, as well as improved current location results. As the first self-driving service, collecting feedback is an important part of getting the experience right. The app can ask for several types of feedback, including during the ride.